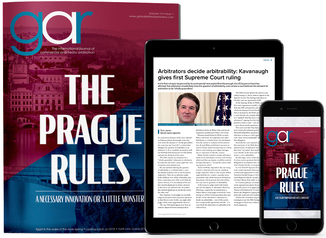 GAR Article: GAR Live lookback: do banks need a special arbitration framework? GAR Live lookback: do banks need a special arbitration framework? A lively discussion between arbitrators, bankers and counsel took place at GAR’s second-ever conference in Frankfurt, with panel members debating whether banks and financial institutions need special rules and exclusive arbitral institutions to overcome their traditional reluctance towards arbitration. “Banks and other financial institutions – do they need specialised arbitration institutes and rules?” formed the topic of the third session of GAR Live Frankfurt 2015. Moderated by Klaus Peter Berger of the German Institution of Arbitration, the panel included Jeffrey Golden of PRIME Finance Foundation (a “banks-only” arbitral institution in The Hague); Jeffrey Rosenthal of Cleary Gottlieb Steen & Hamilton; Dietmar Anders, counsel to Commerzbank, and Peter Werner of the International Swaps and Derivatives Association. This is the third instalment of a project to publish unreported GAR Live sessions from last year and the first to feature a panel from GAR Live Frankfurt 2015. Previously, GAR published a transcript of a third session of GAR Live BITs 2015 in Washington, DC, which examined fragmentation in the investment arbitration system and tools that states can use to create uniformity. Transcripts from other unreported GAR Live sessions will follow in the coming weeks. The session ends with questions from the audience and each panel member’s concluding remarks. The next GAR Live Frankfurt takes place on 2 June. The program may be viewed here. Chair: I told you this morning in my introductory statement that we want to look at the potential of arbitration, the potential of arbitration for resolving disputes in areas where arbitration has not been so popular, and that is exactly what we want to do with this panel. Banks and other financial institutions, do they need specialised arbitration institutions and rules? Before I explain to you what we will do, I would like to introduce to you the panel members very briefly. We are very fortunate to have representatives of the various players in this field of international financial law. We have to my far left Dietmar Anders. He represents the users or should I say the potential users, the banks and financial institutions. Dietmar is the Divisional Head in the Group Legal Department of Commerzbank in Frankfurt. Then we have, obviously, the law firms and to my right is Jeffrey Rosenthal. He is a partner in the New York office of Cleary Gottlieb. He is practising as Counsel in international commercial arbitration, general commercial matters and also in sports law. And then we have the arbitral institutions. We have with us Jeffrey Golden to my left. Jeffrey Golden is the Chairman of the P.R.I.M.E. Finance Foundation in The Hague. In fact, P.R.I.M.E. Finance, this arbitral institution for international financial disputes, is his brainchild and we will come back to that. To a certain extent, Jeff Golden is also representing the law firms because he has been a partner with Allen & Overy and also with other law firms, so he has the experience as both someone who has set up an arbitral institution and someone who has worked in major international law firms. To my far right we have Peter Werner. Peter Werner is representing the standard-setting institutions and that is, of course, a very important group because standardisation is an issue in international financial markets. Peter Werner is the Senior Director at ISDA’s office in London and, as you will hear from me in a minute, we have been in touch for a long time on this subject. Now what we want to do today is this. After a very brief introduction on looking at the timeline in this area, we would like to do a little brainstorming on the arguments in favour and against arbitration in this area. We would then like to take stock and look at the options that we have at the moment on the global market of arbitrations. So what are the options with respect to international financial disputes? What are the approaches that are being offered at the moment? Having that as a background, we would then like to discuss a number of issues which might perhaps cause us to think about the question whether we need special rules, special institutions or maybe nothing of that kind. The two options here are one size fits all or go for variety. So this is what we want to do. We want to do it in a discussion and we urge you and we ask you to participate in that discussion. So if you have something to say, please raise your hand and we will be happy to take you on and hear what you have to say on certain issues. Now coming to the short introduction, what I just would like to do is to provide you with some of the milestones in this development that we have faced over the past years in the area of international financial law. My personal timeline starts on January 2, 1989, because that was the day when I took up my job as assistant at the Banking Law Institute at Cologne University. I was into arbitration already at that time, so I was wondering why do banks not accept arbitration. I had many discussions with bankers and banking lawyers over two decades and they were very short because their response was: “we never did it; we don't need it; we don't want it; we won’t do it in the future”. In 2007, I sent an email to ISDA. I didn’t know anybody at ISDA. Because we had a DIS conference on the subject I asked them whether they thought that arbitration would be something for them. I received back an email in German, much to my surprise, from Peter Werner and he said: well, that’s a coincidence. I am sitting at my desk in London at this moment wondering whether we should consider arbitration, for example, for our Islamic Finance Master Agreements. So that’s when our debate started. Then, of course, there was the financial crisis, 2008/2009, and the financial crisis has changed the picture. While until the financial crisis, banks and financial institutions said ‘well, we settle and, if we don't settle, we will go to court’, now they said ‘we will go to court right away’. They have become much more litigious; they want their money back, and so that was the moment when they finally began to think, to a certain extent at least, about arbitration. In late 2007, Jeff Golden gave a lecture that was published as a seminal article in early 2008 on whether the world needs an International Financial Court and, as a result of that process, in 2012 P.R.I.M.E. Finance was established as the International Arbitration Institution for international financial disputes in The Hague, not only arbitrating these disputes; there are also mediation rules; there are experts for certain legal opinions, and we will hear more on that later. Then in 2013, in September, ISDA, after a long thought process and consultation phase with its members, published the ISDA Arbitration Guide. They call is “1.0” because they will perhaps publish other arbitration guides in the future. That was another very important milestone because it showed that the market leader for OTC derivatives, the global market leader, was finally considering arbitration, not only considering it, but recommending it to its members. Up to that moment and still today, the ISDA Master Agreement 2002 has a ‘tick the box’ choice between English courts when you have English law as the governing law and New York courts when you have New York law as the governing law for the transaction concluded under the Master Agreement. Then in 2014, last year, something very important happened, and that was that the ICC set up a Task Force on exactly that subject – banks and banking and arbitration – and some of us here are members of that Task Force. In the Task Force, we have 12 workstreams where we explore the options for arbitration, the potential for arbitration in lending, in derivatives, in bank-to-bank disputes, and in many other areas. We are conducting interviews at the moment with banks and banking lawyers on this subject. It’s a big group and the idea is to submit a final report next year. The last interesting milestone is that last year the English Chief Justice has set up a working group on how to improve the attractiveness of the English judiciary for international financial disputes. They submitted their proposals four weeks ago, very interesting proposals. We will come back to some of these proposals and it shows the report or the working group was established for the very reason that English courts are now facing competition not only from competing centres like the DIFC in Dubai but also by arbitration. So you see that there are, indeed, a number of very interesting developments since the financial crisis that really have brought this topic on the table. Our topic today is based on a certain assumption, and that assumption is that arbitration is being used and it can be used and it makes sense for banks. The problem that I still see in my many discussions that I have with banks and banking lawyers is that, to a certain extent, bankers and banking lawyers still have problems to understand what arbitration is. There are discussions going on about the benefits of arbitration. What we thought we could do to kick off the discussion is that we do a short brainstorming among ourselves, but you are free to contribute to that brainstorming and see what are typical arguments that are being raised in this discussion in favour of arbitration for international financial disputes, and we are speaking only about B2B disputes here – i.e. banks-to-companies or bank-to-bank disputes. We are not speaking about bank-to-consumer disputes of the type you have in the US. That is not our subject here because it’s a different area. But let us start just by doing a brief brainstorming and see what the major issues here are in this discussion because what we would like to do then later on is to pick up some of these points from our discussion on what should we do. Shall we develop new rules? Shall we live with the rules that we have? Shall we set up other institutions? Shall we all go to P.R.I.M.E. Finance or what would be the perfect approach if there is one? Why don't we start with Dietmar and my question would be, what is your perspective as a user? Dietmar Anders: My brain just stormed a little but came up with two aspects of arbitration that I find noteworthy. One is in favour of arbitration, and that is expertise, and another one might not be in favour of arbitration, and that is costs. What do I mean by that? Let me just sketch out in provocative words what could be the case. Let’s take a judge at a state court who has been doing landlord/tenant law for 10 years and now joins another department at that court and does banking matters. Now I come with my case of an alleged mis-sale of a swap and I wouldn’t find too much expertise, I assume, with this judge. So judges do have expertise but we don't pick them. They just sit in front of us and we don't have a choice. So having a choice means being able to find the right expertise for my case, which I would expect to be somebody who is commercially-minded, who is product-savvy. That is the most important part. So clearly in favour of arbitration. Not in favour of arbitration is a very lengthy procedure, which at times happens in arbitration, so lengthy procedures mean lots of costs. Document production means lots of costs and, typical for an in-house lawyer, I am worried about costs, and especially being a German lawyer, that means for me I don't have document production in state courts, so I save a lot of money by going to a state court. This aspect clearly weighs not in favour of arbitration, so that is my scene for the moment. Chair: Thank you very much. The matter of costs is a very popular one, and a very up-to-date one. We have discussions at the moment as to the costs of arbitration for small and medium-sized companies, so that is something that we also know if you want the real economy in terms of the discussion on the advantages and disadvantages of arbitration. Jeff, what is your spontaneous reaction to the question of what are the pros and cons, arguments in favour and against arbitration in this area? Jeffrey Rosenthal: I have had successful situations, particularly when you have had financial institution versus financial institution disputes, where arbitration has worked and been very successful. There have, obviously, been advantages such as confidentiality, lower profile for arbitration that allowed the parties to adjudicate their dispute without the public appearance in court but, when I talk to my financial institution clients, I think by far the number one reason that I am given for reluctance to pursue arbitration would be the fear of the finality of arbitration and the lack of appeal ability. A lot of the issues that our financial institution clients are dealing with are issues such as, is there a Master Agreement where there are recurring issues; are there are issues of considerable complexity, where they want the advantage of a court ruling, and they want the advantage not only of a court ruling for precedential purposes but also the court ruling in order to have the appellate ability and to get a higher court ruling if the courts don't get it right. Sometimes at the lower courts they don't always get it right and I have found that there’s a lot of fear in pursuing arbitration in these contexts when really the ability to appeal an arbitration ruling is, obviously, quite, quite limited. So I think that is probably the biggest obstacle that I have encountered in talking to clients. Chair: Which is interesting because finality has always been mentioned as a key advantage of arbitration, at least for many decades, but in this area some of these traditional advantages are being questioned, put into question, and we will come back to that later. Peter Werner, from your ISDA perspective? Peter Werner: Thanks, Klaus Peter. From the discussions that we have been having among market participants worldwide, I think two core objections emanated from these debates against arbitration. One is quite odd I thought. It goes back to quasi-religious views that some houses, firms or banks have vis-à-vis arbitration. So it is not necessarily specific to derivatives in our case. It is based on a presumption and a school of thought that certain market participants have vis-à-vis arbitration generally. That was a core objection, so not very specific though. I am not saying that was the majority view. I am just saying that is a con argument that was used. The other one was mentioned by Jeff just now, the other main argument against arbitration or the increased use of arbitration, was the issue of the kind of lack of scrutiny of awards or the lack of appeal. In favour of arbitration, a couple of arguments were mentioned. One, obviously, the perceived worldwide enforceability of arbitral awards, at least a wider range of enforceability of awards than you would have within the judgment space, at least within the EU process or Lugano Convention area or within some bilateral treaties or regional ones. The other argument in favour could be a double-edged sword because at the time when we conducted the surveys, there was some significant bad experience with decisions from certain courts. So as a counter-reaction to what had come at the time out of certain courts, certain judgments which went the wrong way, people said, well, we need an alternative way of dispute resolution so, therefore, let’s go for arbitration but, as we will see later on in the discussion, that might be a double-edged sword because it actually goes back to another, much deeper subject. Chair: I can tell you that some German banks also had their own, very special experience with judgments by German courts, for example, and one area is the area of mis-selling swaps, where we had a number of interesting decisions by the German Federal Supreme Court and we might get back to that later on. Jeff – the other Jeff. Prof. Jeffrey Golden: I’m the other Jeff but I just want to remind the audience that, for you, I’m the right Jeff. (Laughter)... Well, we are coming up with a great list of relevant considerations, Klaus Peter, and let me just try to add a couple of things to it. It has been a shock to me that the markets seem to almost prefer knowing their position, knowing where they are in a certain way and knowing that sooner, even over justice. That is something we should come back to but I think that for many of the lawyers in the room, certainly for me, it took a while to get my head around the fact that when your exposure is as much to the markets as it is to your counterparty, you really need to know where you are. It is no good finding out six years from now that you were correct six years ago when you have, in a sense, had to stand naked to the markets in that interim period. The second thing I would just add is about the role that arbitration potentially could play in the regulatory scheme of things. You know, our newspapers have been full of articles about better regulation, regulation, regulation since the financial crisis but there has almost been no discussion at all about the relevance of arbitration or dispute settlement in the courts to that whole process. I have got a theory and a couple of themes that it inspires that I would like to come back to if there’s more time, but I think the regulators have been putting their heads in the sand on the issue of dispute settlement in the context of, for example, central clearing, for example, in that context, of margin requirements and other disputes that we can imagine coming out of that. I think we should put our heads together rather than in the sand and brainstorm about ways in which arbitration could make a positive difference. We have to do that. We can’t sit back and wait for the innovative thinking in this area to come from them. Chair: Okay, Jeff. I think you are putting the finger to the problem that there is one party missing on the panel, and that is, obviously, a representative of the regulators because the regulators, since the financial crisis, had an enormous impact on the structure of the international financial markets and that could have an impact on the use of arbitration or the question whether arbitration would be beneficial to resolve international financial disputes. With respect to the balancing of justice and speed, we all know this old saying that “justice delayed is justice denied”. That is a discussion, we also know from the users of arbitration in the real economy, that has been ongoing for a long time. Having said that, I think we have heard some arguments in favour and some arguments against arbitration in this area. To get the full picture, the next step would then be to see what are the options available at the moment on the market for arbitration, the global market for arbitration. So what is the market offering to international financial institutions with respect to the resolution of disputes through arbitration? The panel members and also myself, we would like to present to you this landscape – stocktaking, what are the current options? Why don't we start with Jeff, an American perspective on that question. Jeffrey Rosenthal: Sure. Well, the AAA does have some special expedited procedures for commercial financial disputes although the threshold for that is a very low. So for basically anything that I deal with and most of what the people here in the room do, it’s really not very valuable because the expedited procedures apply to financial disputes that are below $75,000. Obviously, you could opt in with greater but there are concerns with them. These expedited procedures apply in which, if it is below $75,000, you would have a single arbitrator appointed by the AAA rather than through a party appointment process, where the AAA gives you a list; you strike; you rank, and then they pick one and this would be even expedited with respect to that. There is really no party involvement in the appointment process at all. The hearing is a one-day hearing, that is the default unless there is good cause shown, and an award is granted within 30 days of the hearing. So all of that makes a lot of sense for smaller disputes. As you get larger disputes, it really isn’t something that I think that we would want to take advantage of because you want more party involvement in connection with the appointment process. There is certainly a lot of hesitation, unless cost is an extreme factor, in going with a single arbitrator as opposed to a panel in which you have a role in the appointment, in particular if you are talking millions of dollars in dispute. My experience has always been when you have parties that have a role in appointing the arbitrators and then to appoint the chair, you wind up with generally a better panel as a whole and better, reasoned results. Then there is the 30-day rule, which is very good but, again, as the disputes get more complex, there’s only so much pressure you could put on the tribunal, although certainly there is a middle ground between the 30 day requirement and taking a year, for example, to get a result. That is, generally speaking, what the AAA landscape looks like. Chair: Okay. Peter, from the ISDA perspective? Peter Werner: Maybe I should just, for the benefit of the audience members that are not that familiar with ISDA, mention one or two features so that you can put things in perspective and why certain decisions have been taken in terms of the documentation. The ISDA Master Agreement is the global standard contract for OTC derivatives transactions in a cross-border context. Around 90% or so of the transactions worldwide are being documented under the ISDA Agreement. The choice of law, as Klaus Peter has indicated earlier, is between New York law and English law, and the New York and London courts in relation to that. Section 13B of that particular document is the jurisdiction clause and the exercise that I referred to earlier that led to the publication of the ISDA arbitration model language in the 2013 Arbitration Guide is what we are talking about here because what the industry now is – market participants are now being offered by ISDA is the standard setter (if you like) for the documentation applicable for these transactions. It’s arbitration clauses for seven different institutions worldwide which are based on the feedback obtained from the survey and they cover the main institutions that have been identified by market participants as being used in ISDA transactions worldwide. Those range from Hong Kong and Singapore to ICC, SIAC, Swiss Rules, P.R.I.M.E. Finance Arbitration, different seats. That is the task that was undertaken as a result of this industry trend and the idea is that for us, as ISDA, being totally new to the world of arbitration – this is an industry that has had no view; it didn’t have a negative view either; it had no view so far really on the use of arbitration in derivatives disputes, before the more formalised discussions started that Klaus Peter alluded to earlier in emerging markets with regard to specific topics. Islamic finance and commodities come to mind in this context. What we thought we would do for the benefit of the industry as a whole is, instead of just publishing some model language, which would have been a fairly straightforward job, we provide guidance to the markets and market participants who previously had not been that familiar with arbitration. So the Arbitration Guide provides you with the model language that is “ISDA-fied” (as we like to call it), so it fits the ISDA documentation for both New York law and English law, as well as the law of the seat, where necessary. It also provides comments to market participants as to the range or the reach of arbitration because we didn’t want to create the impression either that everybody should wholesale blanket-refer to arbitration instead of courts from now on. It’s a choice. People need to make an informed choice and we try to give some guidance as to some of the aspects that people might want to consider when choosing or considering choosing the arbitration. Chair: That is why I said that this is a milestone if a market leader in the area of OTC (over the counter) derivatives then decides to issue an Arbitration Guide. That is, of course, something. It sends a strong signal into the market I think and that is, therefore, I think a very, very important milestone in this whole development. The other important point that you mentioned, and it applies obviously to all the users of arbitration, but especially to the inexperienced ones, is that we have to make choices,, but informed choices. You need to know what is going on. You need to know what arbitration is and how it works but, if you are working in an industry where the market leader, for example, in OTC derivatives had no view on arbitration, didn’t know what it is perhaps and, in my experience, also bankers and banking lawyers, some of them at least – not the ones sitting here and not the ones sitting there, but others do not know what arbitration is. I think that is dangerous and I will show you an example in a moment that really explains the dangers of making wonderful choices as someone who has no idea how it works and what the effect of these choices is. Before I do this, I would pass the word to Dietmar and ask him for other examples of this current landscape, the global landscape in this area. Dietmar Anders: We actually have done some work. We are not just up here for a chat but we did some research and I came up with two special rules that I want to present to you just briefly. One is the Financial Disputes Arbitration Rules from the China International Economic and Trade Arbitration Commission. This is a set of rules that is relatively new, from 2014, revised just now. The approach is to have simplicity of rule-making – that’s how I would call it. It’s a special set of rules. The regular Arbitration Rules are 80 pages and this is just a couple of pages of a smaller set of rules, which is almost like an executive summary of a regular set of arbitration rules. So the idea is to have a speedy procedure and some things in there are rather soft, others are hard, but it’s a set of rules that I think generally addresses some shortcomings of arbitration. There is no mention of the financial industry except for a definition of financial transactions, which is wide open, so it is not industry-related, although it has the name “Financial Industry” in it. The other approach is completely different but also very interesting. That is the London-based Arbitration Club, a platform of arbitration experts. Their approach is in financial services expedited arbitration procedures – as the name suggests, to have an expedited procedure. How do they achieve that goal? They have kind of top-up clauses for existing arbitration rules compatible with ICC, compatible with P.R.I.M.E. Finance. What you can do is you can pick your additional refined clauses, attach them to your regular arbitration clause and in that way you modify the regular procedure in order to gain more speed. This is quite a creative idea, in my view, and it clearly goes for a quicker procedure, with some things that are just more general, let me cite it – avoid unnecessary costs – is there anybody who would not agree? Then, on the other hand, things are very interesting, like no single pleading should exceed 20 single-sided A4 pages, using 12 point Arial font. Congratulations – that is going to be difficult but, indeed, it might and should speed up procedures. Again, there is nothing industry-related, so it’s another attempt at just having a general grip on things like speed. A third thing I just want to mention quickly is Euro Arbitration. This is the set of rules that is not designated to the financial industry but just a regular set of rules. The European Master Agreement makes reference to that but that is, to my knowledge, only used in France and for French counterparties, so that might not be of huge market relevance. Chair: Before I give the word to Jeff Golden, I would like to contribute an example from my own experience as a practising arbitrator. About five or six years ago, I was appointed sole arbitrator in an ICC case and I learned the lesson that when someone tells you ‘don't worry, it’s an easy case’, it is definitely not an easy case. It was a case where a major international bank sued a corporate client with whom it had concluded an ISDA Master Agreement and, under that Master Agreement, a number of foreign exchange transactions because it wanted to hedge itself against foreign exchange exposure from its own export business and the whole thing went wrong. The bank was claiming early termination amounts and close-out amounts under the ISDA Master Agreement that tells all those of you who are not so much into that area that there are certain very technical terms around here that you need to understand, but not only terms; also economic concepts. What happened then was that the foreign corporate party initiated anti-arbitration proceedings in its home courts. The seat was London and then the international bank initiated anti-suit injunctions, proceedings against that foreign party before the English High Court and got two injunctions against that party. Then the foreign corporate party arranged the opening of insolvency proceedings or restructuring proceedings over itself. It then went to New York and applied for recognition of those proceedings in its own country as so-called foreign proceedings under Chapter 15 of the US Bankruptcy Code, which would have meant that all arbitrations that they had, and apparently it had a number of arbitrations because it was right after the financial crisis, would have been stayed. The Bankruptcy Court of the Southern District of New York had a precedent and said no, you cannot use US bankruptcy law as a kind of legal clearing house to get rid of all your arbitrations, even though you don't have any contacts with the US. Then the next thing that happened was that the foreign party decided not to participate in the arbitration. Then, of course, you as an arbitrator are called upon to take a closer look at the case. I mean you always take a close look at the case but, if one party is not showing up, then you, as the tribunal, are under a certain obligation to take an even closer look, which I did and I saw this wonderful plain vanilla ICC arbitration clause in the schedule to the 2002 ISDA Master Agreement and I said oh, wonderful, so no problem. I flipped the page and on the next page there was a clause stating that the parties irrevocably submit to the jurisdiction of the English courts,. Obviously in that scenario, where you do not have one party present, the respondent, you have to raise that. There are some precedents in England exactly on that subject. The end of the story was that the English courts said that the arbitration clause prevails. The argument is tricky but I will not go into the details of that but, anyway, this was an example for a typical ISDA dispute under the ISDA Master Agreement, but conducted under the standard Arbitration Rules of the ICC. So as a résumé, what do we have so far? We have specialised arbitration rules issued by general arbitral institutions. We have guides. AAA has also published a guide on commercial financial disputes. We have the ISDA Guide. We have other specialised rules. We have disputes conducted under general arbitration rules, financial disputes. What remains then, of course, is the question: what about a special arbitral institution for international financial disputes, and that is Jeffrey Golden’s topic. Prof. Jeffrey Golden: -because this is my favourite subject. Prof. Jeffrey Golden: I am passionate about it and we could talk the rest of today and several other days beyond but, in the interests of time, if I had to boil down P.R.I.M.E. Finance to a single word, that word would be “people”. That’s what it is all about. P.R.I.M.E. Finance stands for Panel of Recognised International Market Experts in Finance and I should add dispute settlement as well. I’m keeping the company of two of the PRIME panel members here on today’s panel, distinguished company that that is. They’re actually two of the youngest members of the panel. We have just over 100 experts who have been appointed to the PRIME panel as of today and collectively they represent more than 3,000 years of relevant experience in the financial markets. That list is going to grow tremendously. The last two appointees, the most recent appointees, are Lord Phillips, who recently retired as the first President ever of the United Kingdom Supreme Court, and a Judge named James Peck, who handled all of the Lehman cases in the Bankruptcy Court in the US before his very recent retirement as well. PRIME Finance experts come from a broad range of jurisdictional backgrounds, a broad range of linguistic talent collectively. There’s widespread coverage there. What does P.R.I.M.E. Finance do? Well, what it aims to do are three things: first, to assist directly with dispute settlement, arbitration being the most obvious and the most focused area but also mediation, expert determinations and the greatest call in the earliest days on P.R.I.M.E. Finance has been to involve experts from our list in other arbitrations and in court proceedings. The list is a very transparent one. It is on the website and everybody’s there. There are no secrets about where the talent pool is coming from. That’s one thing. The second thing is it exists also to encourage right answers or support right answers from the courts and to train judges in domestic courts. We have been to Japan twice. We understand that is the first time Japanese judges have ever invited anyone from outside Japan in to train domestic judges on any topic. We have been there twice. We have been to the Singapore Supreme Court twice, Korea twice, Portugal, Russia twice, the United States four times – to the Supreme Court of Delaware and Delaware’s Chancery Court and twice to the New York courts – and once to a collected gathering of judges from the State Business Courts as well. Finally, it is working closely with LexisNexis to develop a database which could be of tremendous interest to this group, a database of international precedents from financial market cases, a library of resource which, surprisingly, given all that is at stake, just hasn’t been there. But what has it actually done in terms of what it also aims to do over time? The first thing I want to highlight is a recent decision made by three P.R.I.M.E. Finance panel members. I had the privilege of chairing that panel. It was a $1.7 billion dispute. It was based on the question of whether at a critical point in time Caesar’s Entertainment had gone belly-up, such as to trigger pay-outs under the credit protection – credit default swaps that had been written on that referenced entity. The market had to know and it had to know right away. The briefs were filed on Monday, supplemental briefs filed on Wednesday, a hearing on the Thursday, final binding decision on that next Monday. Lengthy and reasoned opinion published. The briefs are part of the public record. The decision is on ISDA’s website and available for public review. The hearings were taped and are also available for review. The point is that could only have happened if there were people with requisite background expertise hearing the case. It just could not have happened if the decision-makers had been more generalist not in that timeframe. Speed – I mentioned speed as something we should focus on, Klaus Peter, but speed is something which I would say is highly attractive if the people who are rendering decisions are competent and experienced. It could be a disaster on other facts. So I just wanted to mention that. The judicial training I have already covered. There is a very important conference which people from GAR have supported over the years, which happens once a year in January, end of January, in The Hague, where our experts report out on what they have seen, what they anticipate seeing in the year ahead and there’s an already vibrant, but strengthening, collaboration with the [permanent] Board of Arbitration also based in The Hague, which ensures the requisite [back of] Minister of Sport for the matters coming before us. Let me stop there but, as I said, on the slightest provocation, I can go on for longer. Chair: Perhaps we should mention one more issue, and that is you are offering arbitration rules, you are offering mediation rules, but you are also offering model clauses. Chair: You are also offering so-called ISDA-fied model clauses. Could you perhaps very briefly explain what that means? Prof. Jeffrey Golden: Yes, that’s important. When the ISDA Guide appeared, it was for P.R.I.M.E. Finance, without question, on our timescale, one of those key dates because the ISDA Guide included recommended clauses (three of them) for P.R.I.M.E. Finance arbitrations with a seat in any of London, New York or The Hague. That inspired P.R.I.M.E. Finance working groups to expand the menu of chances and so there are now – I think last count there were nine jurisdictions covered and more to come. In fact, we have one about to appear in Japanese characters for a seated P.R.I.M.E. Finance Arbitration in Japan, and that is important. Going back to the Rules, that is a process which is – I think we have made for the markets key steps forward by focusing on issues we know to be important in these markets but it is a process which continues. We are sitting here, for example, on a Wednesday afternoon but it is already Thursday in Tokyo and financial markets of considerable importance. So when we have notice provisions and the like, it is not just enough to count business days – we have to know whose business days. These are issues of hair-splitting that have been a hallmark of the ISDA documentation library because of the importance attached: taxes; whether it will cost me more to have my hearing here, there or wherever. We go on for pages in our documentation about those issues, currency indemnities and I have seen those matters get short shrift in some of the rules, which again is possibly a reason that the financial markets have sort of shied away. We have to bring them back with the comfort that things that are important to them are important to the procedures as well. Chair: Thank you very much. This finishes the second part of our panel discussion, giving you a broad overview of the current market, the current approaches on the global market for dispute resolution in international finance apart from dispute resolution by domestic courts. What we would like to do now as the third and final part of our panel discussion, is to be more specific and look at some of the points that have been raised and see whether this would perhaps cause us to favour the development of new rules or whether it would make us favour a different approach, for example sticking with what we have. Some of these or most of the issues that we would like to look at more closely now have been raised already in our panel discussion. The first one is time. Now you hear this so often in discussions about international financial arbitration, the need for speed. We need speedier decisions. You raised that point, Jeff, which is why I would like to get back to you and ask you: is it really true that it is all about time? Sometimes it is being said that in international financial transactions very often you have the so-called ‘one shot money dispute’. It is a very easy case. Someone is owing me, as a bank, money, for example, under a loan agreement. I am reclaiming that money. There is no expert. There are no witnesses. All I need is a short hearing and I need speed but is it really true that speed is all that matters? Prof. Jeffrey Golden: Sometimes. I mentioned the profound insight of that secretarial applicant. There is a cost benefit analysis that goes in – speed and accuracy. There is a depth of consideration. It depends in part upon the issues. I mentioned this decision taken in February in the Caesar’s Entertainment arbitration. There was at one point $7 billion issue at that juncture in time but the outcome was going to impact the $26.9 billion portfolio of Caesar CDS that was outstanding, and the question was: it is these contracts that get paid or those contracts. There’s a lot at stake and we had to know right then and there. We had to run an auction under the contracts to determine the measure of pay-out and the like. As I said, getting our head around the need to know quickly and certainly our position, not just legal sanity. The sanity of our market position is a hard one for some of us as lawyers to grasp if it is at the sake of justice and truth and the like. I could point to any number of examples in that ISDA library, as Peter knows. I know him only too well because it is all my fault. I held the pen but there is any number of sections where – let’s take an example of where the parties are relying on a published source for a relevant rate for their contract. It might be a water screen price and what happens of a water screen price as it appears is just wrong – there’s a typo in it; it has got an extra zero or whatever, but it gets corrected, which is the price that I am bound by, the one at the time – I was meant to look at the screen or the corrected price. Now the ISDA documentation says if it is corrected, you will move to the corrected price but only if that correction occurs within one hour. That’s it. If it is later in the day, you are stuck with the extra zero because that is where the markets feel they need to – intermediaries frequently caught between two hard places need to know where they are. So there will be times when speed is of the essence. Chair: Jeff, let me ask you this. Some arbitral institutions, like the DIS, have published supplementary rules for expedited proceedings.The ICC has a special provision in its 2012 Rules on expediting proceedings by, for example, shortening time limits. What we did at DIS, we have supplemented our standard Arbitration Rules by publishing the supplementary set of rules and we say there you can conduct an arbitration with a sole arbitrator in six months, with a three member panel in nine months, and we even reversed the fall-back provision in the German law by saying that the fall-back rule under these expedited rules is one arbitrator, a sole arbitrator, instead of a three member tribunal if no party agreement has been made. Other arbitral institutions have published similar rules. Do you think that this would make sense, to sell this to the banks? Jeffrey Rosenthal: I think yes and no. I think that, as I mentioned before, one arbitrator disputes, in particular, scare people and I think they scare financial institutions very much because it exacerbates the concerns that I had said about finality of arbitration awards, especially if you have recurring disputes, disputes over big dollar amounts, the idea that a single arbitrator could go off the rails is certainly more palpable than if you had three arbitrators and you had more of a role in picking the arbitrators and having confidence in the tribunal. I think that promoting single arbitrator disputes, at least if it is a small dollar amount, then that is something where speed matters much more because justice in a year when you spend $100,000 over a $50,000 dispute is not very effective. If it is a multi-million dollar dispute, the idea that you can get it done quickly with a single arbitrator but it might be more likely to be wrong is not something that is comforting. But taking upon that, I think that there are certain things that specific procedures can help beyond just the expected procedures or the single arbitrator procedures. That is, for example, either bifurcation. Some arbitration tribunal or some arbitration rules specifically will allow or more empower arbitrators or bodies to bifurcate; some don't have that kind of rule. I think the other thing that is very important to a lot of clients but financial institutions, in particular, are the ability to have summary proceedings. One thing that I hear, and that is why I kind of divide up some of our disputes with financial institutions into some of them you have that are very fact-driven and I think when you have the very fact-driven disputes, arbitration can be much more successful. I think some of them are ones where it is more of the legal variety – how are we going to interpret this provision in an ISDA Master Agreement or in a contract between parties and I think there a primary concern with arbitration, in addition to a concern about they might get it wrong or I might not have the ability to appeal or I might have consequences down the road and the like. There is the perception (and I think it is a real perception) that arbitrators are much more reluctant to dispose of matters, either on the papers or in kind of a summary judgment proceeding, without actually having a full evidentiary hearing. Chair: That brings me to my next question, and that is ‘documents only’ arbitrations? You know that the Hong Kong International Arbitration Centre has special rules on ‘documents only’ arbitration for small claims. Would you say that this could make sense in certain situations – even though you may know that the ‘documents only’ arbitrations abbreviation is DON'T (documents only, no travel)? I can tell you that I had it once in my career, a ‘documents only’ case in a commercial arbitration. I was very reluctant to do it because I thought the experience, the general experience, is that during a hearing certain issues that do not look so important in the briefs may become more important when you discuss them with counsel in a hearing. We did it because both parties agreed to do it because there were no experts, there were no witnesses. There were just some legal issues at stake. So we did it and I must say, even though I was very sceptical, it worked. So would that be, of course, on a case by case basis – it’s not a panacea, but would that perhaps help? Jeffrey Rosenthal: I think ‘documents only’, there are really two aspects of that. One is ‘documents only’ where you make your legal submissions to the arbitrator/s and they decide and you have no hearing or argument whatsoever. There are some rules that provide for that and then there is the ‘documents and oral argument’, which I think 99 out of 100 cases your oral argument is going to be helpful because it can answer your arbitrators’ concerns, it can allow the parties to focus in a way that just putting in the papers doesn’t allow them to focus in the same way. I think that is very valuable. The issue is can you do it with just that and not the calling of witnesses because a lot of times, if there is a party that has concerns over the law, they will want to throw witnesses up there and get the focus onto the sympathies or factual disputes that are really not material and I find that arbitrators are typically reluctant to deny a party the right to call a witness and to say off the bat, whereas courts are much more familiar and comfortable with whether it’s kind of a motion to dismiss right off the bat, whether it is in a summary judgment stage and prior to a trial. I found a lot of reluctance and that’s why I advise often parties because ... will a court ultimately enforce an arbitration award or will it find it that there has been a denial of due process if arbitrators chose not to have a hearing at all? You might want to put it into an arbitration clause explicitly empowering the arbitrators to have either a hearing without witnesses or no hearing at all. Chair: I remember a case I had years ago, 10 years ago under the LCIA Rules. It was a case with the seat in in London. A German bank claimed money that it had lent to a foreign borrower. When I arrived there at Fleet Street, at the Dispute Resolution Centre, I realised I had only the Statement of Claim, the Statement of Response, an interest calculation, a Collateral Agreement, and essentially that’s it. It was not more and we did not have the feeling that the hearing really helped us because there were no witnesses and there were no experts. It was just a claim for the payment of money. That was a typical one shot money dispute. It was based on the contract documentation, on the calculation of the interest. Each side had the chance to submit its views. So there it was one of the very rare cases where I thought we could have done that without a hearing. We did a hearing but, again, we all thought on the panel it didn’t really bring us further. We could have decided that even without a hearing. Jeffrey Rosenthal: I recently had an arbitration before the AAA. It was a one-day hearing but it was something that we would have never taken this to a hearing were it in court or something because it was purely legal issues. Each side did have a witness but the entire hearing you kind of felt like this is a sideshow and how are we ensuring that the arbitrators are not getting distracted with this presentation of factual evidence that is of largely undisputed facts? Chair: Yes, exactly. I think that is why it is important to say if you consider a ‘documents only’ arbitration, you can only do it obviously on a case-by-case basis. You need to have a case where you do not have witnesses; you do not have experts; you just have the briefs; you just have the contract documentation. A classical loan – a claim under a Loan Agreement could be such a case perhaps but sometimes they develop and suddenly a very easy loan dispute develops into a huge dispute and then you say no, we need to have a hearing. Chair: Well, that is a very important point. I don't think that you can do it at the time of contracting. You can only do it during the arbitration. I think that is another very important comment. 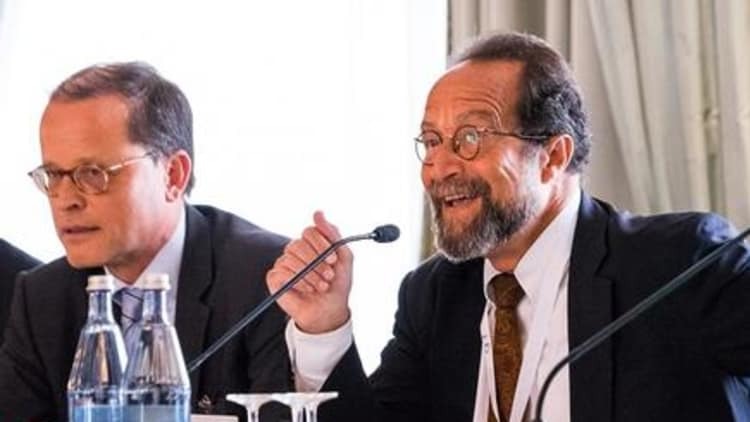 Prof. Jeffrey Golden: Well, I am just going to add in the case that I have been mentioning, where it really was a very high level of dialogue between the counsel for the parties and the expert arbitrators, the hearing was hugely valuable, hugely valuable. It was inquisitive more than passive and I don't think we could have – we would have struggled to meet the deadlines but for that opportunity. It didn’t add that much time. Chair: Let’s stick with this denomination of DONT – ‘documents only’ arbitrations. Now the second point, costs, very briefly, Dietmar, because you raised it – should we amend existing arbitration rules to accommodate the concerns of banks and other financial institutions with respect to costs? Dietmar Anders: Well, I guess it’s difficult to tackle the topic of costs directly in the rules. It goes via speed and efficiency I guess. The only way to reduce costs directly is to cut back on the fees for the arbitration organisation. That’s kind of unfair to cut back on the fees for the arbitrators. That I also wouldn’t like to see. And perhaps to cut back on the fees for the law firms involved and I guess they won’t be happy with that because those are actual billable hours that are really spent and that are worth the money. So how do we get out of this? We can’t dispose of any element and thereby saving costs. We need to do that via speed and efficiency. So I have a hard time thinking about a specific, newly introduced rule in a set of arbitration rules that directly deals with the issue. That’s kind of a tough one that is rather attached to other elements of arbitration, like speed. We had some discussion in the preparation to this panel about different cost scales. That could be an option, having bigger procedures with more costs but having some sort of discount or lower cost for lower procedures. Now, for me specifically, coming from a bank, what we would bring into arbitration is rather the big cases, so that wouldn’t help me either. Ultimately, it’s a tough issue. It looks costly but then I also need to remind myself I need to be objective in what I compare. I have usually three instances in Germany. If I go to the state court, I start with a lower level. Then there are appellate procedures and then there is the Federal Supreme Court. Well, I can’t compare my first instance with the full cost of arbitration because that is always this one final instance and that’s it. So to be fair, I would have to add all the costs I have until I finally sit in front of the Federal Supreme Court and then matters might look different and then it might be equally costly. It is hard to have exact evidence on that but that’s my idea. So costs is rather a gut feeling than a thing that I could specifically tailor to my purposes, unfortunately. Chair: So your response is essentially time is money. Dietmar Anders: Time is money. Time is money. Chair: What about the much more important issue I think that has been raised by a number of the panellists here and I am addressing it now to Peter Werner, and that is expertise, the expertise of the arbitrators.If you look at the complexity of financial products, if you look at the global financial markets, how they present themselves today, you realise immediately that you are dealing with highly complex products, with highly complex contracts, with master agreements, with code words,with a special language. How do you ensure expertise, Peter? Peter Werner: At the outset I mentioned one of the reasons that we came across in favour of arbitration was the bad experience that certain people had in courts and I said this is a double-edged sword. The reason for saying this is that at the bottom of that particular argument, what really is being said is that the perception was that the courts didn’t know what they were doing. In the further discussions that we had within ISDA, it turns out that the lack of expert – or the other way around – there is a clear need for experts to be involved in arbitration proceedings around such technical matters as an ISDA Master Agreement or a related contract. Please don't perceive this discussion to be ISDA-specific. This is a discussion that you can extend into other types of financial contracts fairly easily as well, so ISDA is just the main example of this kind of contract being used worldwide. So there is a clear need of experts and, for me, at the time when we started this project, I was a novice to arbitration completely and had no bias either way. What stunned me a bit I must say is the confidence certain arbitration experts showed when they approached us and said ‘we want to be involved in this; please do this or that in terms of the ISDA model language to be developed at the time’ and I or anybody else that called me at the time, I would like to be nominated by ISDA to be a part of these arbitration proceedings to be conducted later on. When I asked them about any particular experience in ISDA or derivatives disputes, the uniform answer by all of them was ‘none’, except one guy who mentioned to me that he had worked at a bank in Germany actually 10 years before. That is a clear contradiction to the outcome of our survey among market participants. There were clear calls for the need for people to be involved that come from markets, that have a business background rather than a legal background. When it was about a legal background, it was more about the documentation as opposed to arbitration proceedings and how to conduct these. So for me, as a newcomer to this, I thought that is an interesting outcome to what I had perceived the arbitration community to convey because my impression was always they can do any dispute at any time, anywhere, and I don't believe that works for ISDA or derivatives generally. I am going to say one more thing because Dietmar is going to add a couple of points on this point as well, on this item. The lack of experts is something that we encountered as applying equally to courts and tribunals. That is obvious. What does that mean? We need experts in derivatives that can handle both fora, of course, at different stages, as indicated earlier, so it doesn’t need to come to commercial arbitration or formal court proceedings because then the relationship is usually over. You don't want to get there in most cases or in many cases. What that also means is that you need experts that are familiar with various legal systems, the ones that underpin the ISDA documentation, for example, but also the jurisdiction of the counterparties and their respective legal systems. Languages come with it, language skills. For some people that might be obvious but that has been highlighted in particular. What is also very specific to the ISDA and comes further to my statement that I think the ISDA expertise needed here is specific to this particular kind of business, is you need also expertise in different asset classes in derivatives. I am breaking it down even further. I don't think you can find somebody who can equally adjudicate disputes in commodities in the same way that this would be in currencies. Chair: So you would even divide expertise in the various fields that we see on the global market, for example, for derivatives or loans?. Peter Werner: Yes, derivatives, loans, repurchase agreements, securities lending, commodity sales (if you like) and related business, that you need clear silos I think. Chair: Okay. Dietmar, you mentioned in our internal debates that we may run into problems when we put so much emphasis on getting the right persons, and the keywords were “sourcing” and “conflicts”. Dietmar Anders: Sourcing is an issue for me and [remember] that arbitration gives the promise of better expertise and we have to live up to this in practice. Now with banks being reluctant towards arbitration, we might not have a problem for a couple of cases, just a small number of cases, to find arbitrators with the right expertise, but that’s not, as I understand it, the mid-term or long-term goal. The long-term goal is that banks really should open up to arbitration. That means we need a number of experts to really have this better expertise. In my case, what we will be talking about, as a bank, is mostly mis-selling of products, derivatives or securities and in that area I know a lot of German judges who know a lot about these products and I want to see that I can find enough arbitrators to switch over from courts to arbitration. If you just think a moment about sheer numbers, let’s assume one single bank has 20 or 30 large-scale mis-sell disputes per year, each of them in the one or two-figure million area, we need a lot of arbitrators who can still claim, well, I know what a target range forward is, I know what a receiver swap is, I know what a commodity swap is, what a credit linked note is. I want to see where all these people come from and, if we finally find them, we might run into conflict issues, and that’s another thing I am worried about. I know from past arbitration disputes where our bank was involved that we spent a lot of time talking about conflict issues when arbitrators came from law firms. We retain a number of law firms, a wide variety, throughout the entire scene and, of course, the other party then has a happy time attacking us and our arbitrator for not being objective because there was once an instruction from us to that law firm. So if we spend in each of these cases where we want to quickly settle a derivatives dispute, if you start all these disputes by discussing the arbitrators and if they are conflicted and if they have the right expertise – in each of these disputes we spend two months on that issue and that can’t be it and, ultimately, we might not have enough experts. Then if we retain the same arbitrators all the time, we might get into issues that were discussed in the first panel. I mean do we have some sort of parallel instructions for parallel cases to certain arbitrators? That’s a landscape that I cannot really imagine at this time. It might ultimately evolve probably but right now I wouldn’t be able to name 50, 60, 70 people out of the blue who could be the right experts, and we are talking about just a single bank. The numbers I gave you, 20-30 cases per year, that’s just one bank. Imagine there are 10 or 20 banks and litigation in the state court comes in waves. If we have such a wave that needs to be handled by arbitration tribunals, it is going to be a hard time that we might have with this. That is a concern for me but perhaps we have answers in the form of P.R.I.M.E. Finance, where we have a standing list. We will come to that in a moment I guess. Prof. Jeffrey Golden: Right, I’m going to (off-mic)...of 100 plus experts. So if 60-70 has increased by a very dramatic percentage just on that basis alone. Look, there’s a couple of things here and it’s a lesson I think we have learned –first of all, everything that Dietmar said has inspired P.R.I.M.E. Finance projects. That really is an attempt to be responsive to these kinds of concerns but it is not going to happen in the financial markets by just sitting and wishing for a better place. It is not going to fall out of the sky and onto the banks’ laps. You are going to have to proactively [find] these people. What hasn’t been mentioned is the challenge that in these markets, how quickly someone who was expert can date and the need to in a sense make this an ongoing process.We alluded to the financial list consultation that has just closed in the UK and there is a recognition in that, that it is not just about getting a list of financially expert judges, but keeping them expert and training them... I think that’s the challenge we have in the arbitration community as well. I think in that there is a very interesting debate about whether it is easier to teach somebody who really understands finance the ins and outs of arbitration or to teach somebody who understands arbitration ins and outs. I have got a personal view but I think the short answer is we need both and the model that again P.R.I.M.E. is advancing is one where you can draw on inter-disciplinary expertise, the kind of expertise Peter alluded to, the case again that I keep referring to, to arbitrators that I share duties with. One was a law professor who had formally been at a bank before that major law firm. The other was a banker, no legal training or experience but had been part of the group at JP Morgan prior to his retirement, who had invented credit derivative product. I have to tell you it was hugely valuable having that collective experience. In fact, I would say it was all of which was clearly greater than the sum of the parts. Chair: Okay. Jeff, do you want to add something? Jeffrey Rosenthal: I think that the ability to have experts is by far the biggest selling point for arbitration to financial institutions because I found in my experience courts really struggle with the ISDA Master Agreement and related financial documents. You can get some great judges who really get it and you can get some judges whose background isn’t anything at all similar to what they’re going to encounter when they deal with us. I had a recent case, for example, where the question was the sufficiency of the creditor event notice and we had experts come in to talk about it’s a combination of factual and legal issue and, actually, we had a judge who we thought was really good and got it and we were on the eve of trial and she was promoted to an Appellate Court and we got a brand new judge who has just joined the commercial part and it changed the dynamic then because you are now getting an unknown and the idea of having experts who you could more confidence in, I think, to me is a big selling point. You also have in the United States, and you really cannot deal with this through arbitration, but you have a lot of tension between US Bankruptcy Courts and higher courts on things like the application of the safe harbours. Safe harbours, for those who aren’t familiar, are the types of transactions involving primarily financial institutions but that are exempt from avoidance actions or claw-back actions. When a company goes bankrupt, then they go out and they sue all the people who got allegedly preferential payments within X number of months before a bankruptcy but, for the stability of the financial markets, there are laws that say that these are exempt from those types of actions. I have found that Bankruptcy Courts, because of Bankruptcy Court jurisdiction, they typically can override arbitration clauses or any other jurisdictional clauses and require actions to be brought in a Bankruptcy Court. We have a lot of cases where bankruptcy judges – and it is funny you mentioned Judge Peck being one of your panellists – bankruptcy judges are often very reluctant to apply safe harbours I find and you have financial institutions that have to stomach the initial loss and be prepared to take it up to an Appellate Court and you get Appellate Courts who, not uncommonly, are reversing Bankruptcy Courts on applications of safe harbours. The other thing that kind of again – you know, calls for expertise, you have potential inconsistent rulings and again, harkening back to Judge Peck, we have got really incredible case studies through the Lehman bankruptcy where you have Lehman Brothers Holding, the parent company, is in bankruptcy in New York. Judge Peck, before he retired, was the presiding judge over that. You had one of Lehman’s major arms, LBIE, in proceedings in the UK and there were several matters in which there were simultaneous litigations involving the same issue for LBHI in New York and for LBIE in the UK, where you have gotten completely 180 degrees opposite decisions as to whether it is applicability of a safe harbour or it would be a provision characterised as a flip clause and whether the waterfall can change automatically as opposed to just by somebody taking action based upon a company filing for bankruptcy. You have got a real problem I think with financial institutions now dealing with these conflicting decisions and really not having the ability to take that to arbitration. Chair: Jeff, can I stick with you for a second because you raised another very important point in our initial brainstorming, and that is the banks’ perceived need for a guarantee of a right decision or, to put it the other way around, the dangers of the arbitrators’ right to err. So what do we do with that? Is that a real concern and, if yes, how do we tackle that? Do we there introduce something with respect to traditional arbitration rules? Jeffrey Rosenthal: And this is where, again, we are opening a Pandora’s box that we could spend an entire day just talking about this one particular issue. There are arbitral bodies and, for better or for worse, people can talk all about their negatives for as long as you want but they do have appellate procedures ranging from an appellate procedure that is kind of akin to seeking to vacate an award in a court, a very, very high standard of you have to show something on the level of a manifest district for the law or something of the like. You have some bodies that have an appellate procedure that is more of an intermediate level like an Appellate Court would do, in which you would have clear error of law which is a high standard but not quite the standard that you would have to go to vacate an arbitration award. There’s also bodies that basically can allow, if the parties opt into this procedure, essentially a do-over before a new panel. I don't think that I would advocate them because, in fact, you have surveys that are done that show overwhelmingly financial institutions and, in general, commercial parties that do arbitration by a 9:1 or so ratio favour the finality of arbitration and, if you start invoking these appellate procedures, you are taking away a key aspect of that. I think the idea is to get the experts involved upfront, get confidence in the panel you are getting in order to achieve the right result. Chair: Can I just ask Jeff a question? For a very specific reason, P.R.I.M.E. Finance is located in the Netherlands, in The Hague, and you may know that the new Dutch Arbitration Act, the 2015 Dutch Arbitration Act, which entered into force I think on January 1, has specific provisions on arbitral appeal procedures. The parties must agree on that obviously. We have in New York the AAA ICDR published optional appellate arbitration rules to allow for an arbitral procedure. Would that perhaps accommodate the banks’ concerns? Prof. Jeffrey Golden: Well, first of all, I should point out that, although our back office, our headquarters (if you like) happens to be in The Hague, as I mentioned earlier, P.R.I.M.E. Finance contemplates seats around the world and they can go wherever the parties would wish it to be and choose applicable law accordingly. To me, again the answer is people. The greatest guarantee of getting right answers, I think, is making sure that the right people are involved in the process. That is not just the arbitrators, the people who decide the issue, but it is also getting increasingly more sophisticated and specialised [lawyer] who can brief them in an effective way and be an aid in that sort of thing. You know, my wife is a lay Magistrate Judge in the UK in the Criminal Court and every case begins in the Magistrate’s Court, 90% plus of them I think stay there and there are relatively few appeals from the decisions of the Magistrate’s Court. Having said that, I think an appeal process is absolutely critical when you have got decisions about whether somebody is going to go to jail being taken by lay experts even if they have a legal expert feeding into the process, absolutely so but less clear. Why? Because in every jurisdiction that I know there is a court from which you can’t appeal and, if you start there, why you would necessarily feel the importance to getting a second opinion if you started with the people who are recognised to be most expert, and that is really what we are trying to arrange for. It is to capture that talent so that people can get people who will be expert in the first instance without the need to run up a system that would take that much longer and spend that much money. Chair: Peter, from your consultation with your members, was that a subject, the question of arbitral appeal or any appeal, any possibility to appeal arbitral awards? Peter Werner: Well, it has been mentioned by some as either a benefit or a negative but in the overall picture of things I wouldn’t call it the main point as opposed to, for example, the expertise point that we discussed earlier. Chair: Okay. Now we are close to 3.30 and, before I give my colleagues here a chance to say a final word on their view as to ‘one size fits all or go for variety’, I haven’t seen any hands here. Do you have any comment or any view on the issues that we raised here? Audience Member: (Off-mic)... I come from the jurisdiction of Sweden where banks are, I would say, much more positive towards arbitration. I have then also followed the efforts of Klaus Peter Berger in Germany to promote arbitration to the bank and I have seen Commerzbank being a member of panels and discussions many times. My question is where are the others and what is going on in the German Association of Banks and could we, as the arbitration community, do something more really to support Commerzbank as a trendsetter for arbitration in the banking world? Thank you. Dietmar Anders: Well, first of all, thank you for the laurels. I kind of take from this that we are the market leader in this issue. No, but seriously there is discussion among banks, bilateral discussions, not in an organised way yet. If you want to have industry-wide solutions in Germany, you would have to go to the industry association, which is the Association of German Banks or Bundesverband deutscher Banken. That is a tough one because there are many institutions that have to agree on something and then, ultimately, it would be fed into a new version of the industry-wide standardised general terms of business of the banks in Germany. Well, that’s not something that is going to happen overnight so that is why we don't see probably any organised discussion but there are discussions among the different houses. I personally have been in contact with some colleagues at other houses about this issue. I guess it’s a matter to finally get started with some test cases and then see how we take it from there. Chair: I can give you a very clear answer on that. I have been in touch with the General Counsel of a German Banking Federation on this issue for a number of years. I called him, I talked to him and his answer was always the same: we, as the Banking Federation, do not take up that topic on our own. We need input from our member banks. So far, the communication with our member banks on this issue is (and that is his word, not my word) zero. So my recommendation would be that Dietmar and all those other lawyers who discuss it should then really go to the Banking Federation and tell them that that is a subject because, so far, it is not. Dietmar Anders: Or, as a quicker fix to the problem, we should just go ahead ourselves or some of the banks could go ahead. To be realistic, what we are going to see soon might be ex post arbitration but no definite introduction of arbitration clauses in the general terms that then applies to all products, all customers. That is just simply not realistic. So it would be ex post and it would be about some of the houses just to start but I wouldn’t favour the way of first having an industry-wide agreement and then start because that is not going to be practical. Chair: We are running out of time slowly but we still have another comment there. Audience Member: (Off-mic ...)... Very briefly, it strikes me that, given the prevalence of the ISDA Master Agreement, where you have got a dispute that relates to the interpretation of the clauses of that agreement, the financial community has got a real interest in knowing both how that dispute has been resolved by a tribunal and also really in endowing that resolution of that dispute with some precedential force so that other people, other market participants, that have got the same dispute over the same provision in the future can know where they stand. I was wondering whether the panel have got ideas as to how the arbitral panels can try to give both the publicity and some de facto precedential force to those rulings on interpretation of the agreement. Chair: This is, indeed, a very important issue and I would like to give Peter Werner the opportunity to briefly touch upon this issue. Chair: Thank you very much. What we want to do is just one sentence from each panellist as a concluding remark but, please, just one sentence. (Audience Member: Thanks. I am (off-mic)... but before that, in a previous life, I was an equity derivatives salesman at what was then Dresdner Bank. So I have (if you like) a market participant’s perspective on this and one thing that occurred to me, one of my old jobs was I would work on the trading floor. We would dream up all kinds of wonderful derivative ideas and we would run around Europe and try and sell them to local savings banks and the problem – I think this is the problem, so this is what I want to hear from the panel maybe quickly, is you put an ISDA Agreement in place between Dresdner and Banca Monte del Paschi but Monte del Paschi buys that derivative from Dresdner and then sells an investment product to its retail savings guys. The problem is can you put an arbitration clause in the ISDA Agreement between Dresdner and Monte del Paschi because you are going to need a local core clause in the retail savings probably that you sell to all those wonderful residents of Italy. So my question is, is there any way to reconcile that? Prof. Jeffrey Golden: I think you raise a point which I am worried is just below the radar screen of the regulators. I do think, in a sense, pushing people to all kinds of perceived beneficial solutions, we have to make sure that they are thinking about dispute settlement is as sophisticated as it needs to be and they have to appreciate those kinds of challenges. It is something that we should be working on. Chair: Thank you and now the final words by our panellists. Dietmar, just one sentence or two, but not more. Dietmar Anders: Arbitration on financial products on a B2B basis in selected situations is good. The obstacles are the mindset and practicalities and least of them are special rules. Prof. Jeffrey Golden: Well, I am of the view that one size does not fit all but it makes no sense for people to be getting on aeroplanes, flying off to remote places to get involved in proceedings in a language foreign to their native tongue and spending lots of money for decisions which aren’t enforceable where they need to be, back home. It makes no sense to send people to their local courts for decisions which will be binding but which are delivered by judges without the requisite experience or competence in these matters. I think the markets would rather have a non-binding right decision than a binding wrong one. It makes no sense even in experienced courts to leave this to a roll of the dice (which judge am I going to get; is it the right one) when we have any number of experienced dispute settlement experts standing ready to step in and do this and you can identify the right ones for the right issues. I think it is also shocking that we have no specialised courts or arbitration centres for finance when we have special subject matter courts for everything from juvenile crime to family law to insolvency and tax and IP, etcetera, but not finance. World trade sports, everybody has it but not finance. Is it less global? Is it less systemically relevant? Is it less complicated? I don't think so. Finally, I don't think it makes sense to put all of our eggs in the financial markets, all of our eggs in a single basket of better regulation as preventive medicine. I think we need some hospitals as well. Chair: This was more than three sentences, but I forgive you. Jeffrey Rosenthal: I was going to cede him my instances. Anyway, we have spoken a lot about ISDA and complex financial contracts but one thing also to keep in mind just the flexibility that arbitration offers, whether it is M&A agreements involving banks or the sale of loan portfolios. Klaus Peter, you were an arbitrator on a case where we had two financial institutions involving a multi-billion euro loan portfolio that was sold where there were allegations of misrepresentations within the data of the loan portfolio and arbitration in that context offers flexibility far, far beyond what a court is going to offer you. The way in which the hearing was structured and certain issues were handled first and certain issues were deferred till later really was instrumental, I thought, in the resolution of that dispute that we could have never accomplished in courts. It is important not to lose sight of that from a financial institution perspective as well. Peter Werner: Well, it’s people I guess. That’s it because, whatever forum we choose for a dispute, the real problem is to get the experts into the room at any stage and that is irrespective of arbitration or courts.